Like all top chess engines, Stockfish is a super-tactician and as such it’s normally able to uncover any forced-mate sequences that aren’t excessively long. Yet there are certain directmate problems – composed positions requiring the quickest forced-mate to be found – that are relatively short but which confound the engine. A year ago in a blog I wrote about such an exceptional composition, a 9-mover that was unsolved even when its solution was truncated. Given that Stockfish has had two new releases since that post appeared, it seems appropriate to provide an update on its progression as a problem solver. Furthermore, I will present another superb directmate that stumped the engine. Not only is this problem even shorter than the 9-mover, but it possesses an unusual feature that might explain why the program has trouble unravelling either of these works. As a recap, here is Theodor Siers’ 9-move problem that was fully analysed in the earlier blog. At the time, the Stockfish version 8 on Chess.com could not find its solution after running for an hour. Even if we simplify the problem by removing the first few moves of its main variation, the engine failed to solve it until the play is reduced to 5 moves. That means Siers’ problem at the mate-in-6 stage could be the shortest forced-mate sequence that “defeats” Stockfish. Let us analyse this curious position. 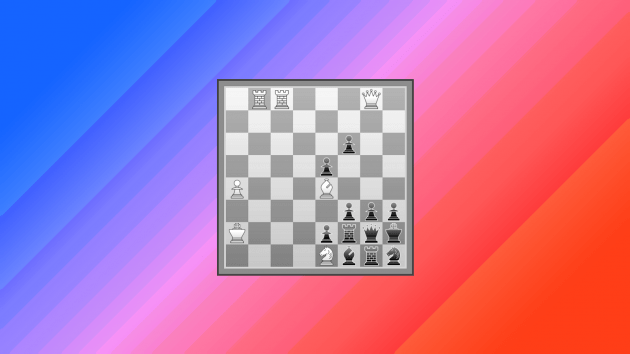 Black’s pieces are completely locked up in the corner, but they form a strong fortress against which White cannot break through, at least not in time. Here’s a try sequence that Stockfish finds almost instantaneously, where White launches a successful assault on h3 – 1.Qe6 f5 2.Bxf5 e4 3.Rh8 e3 4.Bxh3 Qxh3 5.Rxh3+ Bxh3 6.Rh8 Rxe1 7.Qxh3+ Kg1 8.Qxh1, but the mate is one move too slow! As one might expect, the actual solution requires a more subtle approach. White’s plan is to deploy the knight to execute a smothered mate on g4, but the piece cannot begins its three-move trip immediately because 1…e1=Q would unleash the black force against the white king. Rather, White must start with four preparatory moves designed to protect the king, so that the knight trip becomes safe to play. If White shifts the bishop as part of this fore-plan, Black’s e5- and f6-pawns will be forced by zugzwang to march forward two steps each, conveniently unguarding the three squares that the knight wants to access (Nd3-e5-g4). How does White use the first four moves to secure the king against disruptive black checks that could follow …e1=Q, a move that not only adds a queen but also activates the f2-rook and f1-bishop? The difficulty here seems but compounded by the powerful white force available, which offers numerous options for shielding the king, and the king itself has many potential hiding squares to choose from. Let’s try placing the piece on a1, for example: 1.Ka1 f5 2.Bb1 e4 3.Rc1 f4 4.Rb2 e3 5.Nd3, and after 5…e1=Q the white pieces have blocked all queen checks and also …Ra2+, hence 6.Ne5 and 7.Ng4 seem unstoppable. But in fact Black can refute with 5…e1=N!, since 6.Ne5 Nc2+! checks after all and there’s no mate next move. The correct fore-plan sees all four white line-pieces making attractive long-range moves to cover the king, which stays on its initial square. Notice how White’s move order is neatly forced, as these line-pieces must avoid interfering with each other. 1.Rc1! f5 2.Bc2! e4 3.Rb2! f4 4.Qb3! e3 5.Nd3 e1=Q; now that the coordinated white army has forestalled checks by Black’s promoted queen, f2-rook, and f1-bishop, 6.Ne5 is viable and Black cannot prevent 7.Ng4.